The search function on this forum has been a big help for me while working with first gen hacking, so I thought I'd make a small contribution myself, instead of just mooching. This is for some new people who may stumble upon this place and may want to work with pokered. I've been working on my pokémon roster a lot as of late, and since I have a day off, I will try to make a tutorial on adding a new pokémon in pokered. More experienced people are welcome to chime in, if I made a mistake, or didn't explain a function properly enough, since this is pretty much a "layman's understanding" of how things work. I hope this helps someone out. Before you begin, you have to move Mew's base stats data from main.asm to your data/base_stats file after Mewtwo. It has to be after Mewtwo, I will explain this later. You accomplish this by searching for "Mew" in main.asm, and you should come across an "INCLUDE" that has "baseStats/mew.asm" in it. Copy the INCLUDE, and move it to your base_stats file located in data. And, like I said, after "data/baseStats/mewtwo.asm". First off, in Pokémon Red and Blue, there are 39 "Missingnos", as in pokémon slots that are in the code, but aren't in "use". This is a big advantage that Red and Blue have. It is possible to add Pokémon past the last "indexed" pokémon, which is Victreebel, but since the game, by default, can only handle 255 pokémon, 39 of which are the Missingnos, it's recommended to at least use the Missingno slots first. Now, this is the way I do it, but obviously there are more than one way to add a new pokémon, I'll just try to include all the steps needed. These things are pretty self-explanatory since they are commented on. You can obviously just check out the existing pokémon's base stats, but I will now show my Lanturn here, since Lanturn is my favourite pokémon - seriously, run a combination of Stockpile, Ice Beam, Charge Beam/Thunderbolt and Surf and you get mad coverage and sweep through almost any of the gam.. Wow, offtopic. The reason I have the lone "1" as the third entry of the first line of the learnset data in my blank base stats file is because it contains Toxic, and with only a few exceptions, most pokémon can learn Toxic in every game. Obviously "1" stands for pokémon being able to learn said TM, while "0" means that it can't learn it. I have changed the TMs in my game where the Lanturn is from, so that's why the learnset data my seem confusing when compared to the TMs. The reason I have "db BANK(LanturnPicFront)" as the last entry is because of a code that allows the inclusion of more and bigger backsprites to the game, since I'm using GSC style backsprites. You don't have to care about it for now. Chikorita is #152 in my pokédex, so it's included after the #151 Mew. This is the reason we moved Mew out main.asm earlier. If Mew is not included here, and you don't do any other changes to the ROM, the added pokémon won't work. I believe the sprites at least are not going to function properly. Okay, so next up is cries. But before we get to that, this is also where the Missingno slots come into play. They are all commented on in pokered, so they are easy to find just by using a search. Any slot that says Missingno is free to use for a new pokémon. It's also good to memorize the slot that you used for your pokémon, since you will be using that information later. Actually, if better documentation exists, someone should let me know, and it could be added to this tutorial. Cry is mostly fine tuning your pokémon, anyway, so right now it's more important to actually insert a functioning pokémon to the game. evos_moves.asm is up next. This contains the data that determines the evolution and naturally - as in not through TMs/HMs - learned moves. If you memorized the Missingno slot you used to put your cry in, find that same slot for your evolution and moveset data. You always need to include the "db 0" after the evolution and move set data respectively. That's how the game knows that one "set" of information ends before another begins. So, in short, find the Missingno slot you used for the cry and enter your pokémon's evolution and moveset data. This is obviously really easy since you have 151 examples of how the information is typed in already. It's useful to make a comment after the palette with ";" so that it's easier for you find stuff and edit later on if such a need arises. So, pick a color palette you think best suits your pokémon and enter it below the color palette for Mew. Okay, so next up is mon_party_sprites. These determine the mini sprites that are displayed in your party menu next to the mons' hp bars and whatnot. They are pretty obvious for the most part, SPRITE_MON is the Rhydon sprite. Again, here it's especially helpful to comment on the pokémon pairs for future editing purposes, since the data can be a bit hard to follow. And the "@" ends the entry. Make sure you remember to add it after every pokédex entry, I always forget. The very next file is "pokédex order", which, unlike the name would suggest, is not about the order of pokémon in your pokédex, but rather the index numbered list of the mons in the game. Rhydon is first entry in a vanilla pokémon Red, since the mons are listed in the order they were created, or at least that's what's been speculated. All you really need to here is find your Missingno you're replacing and place "DEX_NEWMON" on top of it. And that is actually it for "data". Next up, we move to "constants". This is as straightforward as it gets. You edit two files: pokedex_constants and pokemon_constants. In the first one, you simply add your new pokémon to the list after Mew and give it an EQU value of 152. 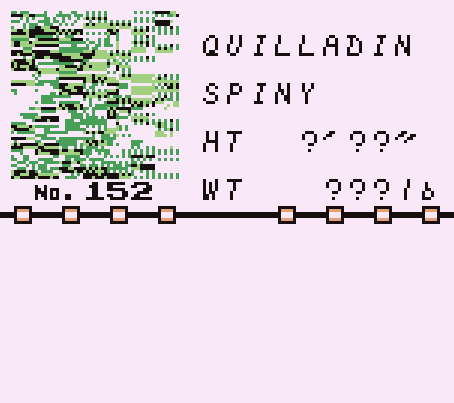 Then, you once again find your Missingno slot in pokemon_constants and replace it with the name of your new pokémon. That's it for constants. "Text" is where we are headed next. And in said "text", we edit two files: monster_names.asm and pokedex.asm. Monster_names, as you might have guessed, contains the names of the pokémon. The index numbered, so find your Missingno and type in the name of the mon. Note that the mon names are 10 characters long, and if the name of poké is less than 10 characters, you fill in the remaining characters using "@". Lanturn is "LANTURN@@@", whereas Victreebel is just "VICTREEBEL". Then we get to what I feel is the most annoying part of adding new pokémon: the text portion of the pokédex entry. Someone could actually let me know if they know what the character limit is per line without the text overflowing, because I haven't checked that out myself. However, the game seems to use three words per line for the most part for the entries, so that's what I've tried to do. The actual inserting of the entries is easy, and you can easily just copy the format from an existing entry. Three lines per page, two pages. Initiated with "text", then "next", "next", "page" for second page, and again "next", "next". "dex" ends the entry. It may take a few tries to get it right without the text overflowing all over the place, and it can be annoying, but you shouldn't have too much trouble with it. Just study the existing entries. And obviously name the entry "_NewMonDexEntry", since that is what we wrote in the main pokédex entry. This is where TX_FAR points to. Now all that is left is going to main.asm, and finding the banks that contain your pokémon sprites, and adding the path of your new pokémon's front and backsprite to the bank section. Where the section after INCBIN is where you have saved your sprites. I follow the original format myself, but obviously you can do whatever you want. The point is that the path exists and contains the sprites. I actually wrote this twice, since I accidently closed my browser the first time I was making this, so I hope I didn't skip something important, or lose track of what I was supposed to do or say. If someone notices errors, or has something, anything, to add, please do. This is all easy once you get the idea of what you're doing and why. I may make some additions to this, but honestly, since I already made this twice, I'll just let this be for now. If you followed my steps - and I didn't forget anything important - you should now have a new functioning pokémon in your rom hack project. I really hope that if someone new - I'm still new myself - wants to get started, sees this and maybe finds this helpful. Not only is this the way to add new pokémon, but it also kind of shows the way pokered works and how it handles data. Someone will most likely find this really useful and can also learn quite a lot from doing this. Either the browser closes by accident, blue screen error pops up on Windows OS when you have done some unsaved work (on anything really) etc. That's cool :) I'm a Finn too. You can write more fluently than I can though, but not like I would have ever been that great at English. Mistä päin oot muuten kotoisin? This is very useful. My only comment is that your way of representing tm learn sets is out dated. You may also be interested in this tutorial I made. Riihimäeltä. Ja ihan hyvin ymmärrettävää sun englannin kielesi on. Jotain sanajärjestysvirheitä, mutta ihan hyvin ymmärtää aina mitä tarkoitat. Itse asiassa törmäsin sun tutoriaaleihin YouTubessa aikoinaan, ja ne auttoi paljon varsinkin HEX-editoinnin ymmärtämisessä. :) Suomalaisena tiedän miten vaikeaa voi olla "julkisesti" mikrofoniin puhuminen, joten arvostan. :D Missä itse asut? Whoa, that new format is so much better than the old one. I wasn't even aware. Thanks for letting me now. And it's good that you posted your tutorial, since these two together should make it pretty easy for everybody to understand how this works. I agree. My tutorial has the benefit of showing exactly what needs to be edited in which files, but neglects to explain why certain changes are being made. Yours does a good job at explaining why each change has to be made, but doesn't explicitly demonstrate the changes. These were both awesome tutorials! Thank you! I want to say, though, that I followed Danny-E 33's tutorial exactly, but am encountering some weirdness, perhaps someone can shed some light? The main weird thing is that my new Chikorita for some reason will always start out with an additional move (Horn Drill), which is not defined anywhere for it in neither chikorita.asm nor evos_moves.asm ... further more, none of the level up moves seem to be working for ANY of the three added Pokemon, despite them being defined and compiling with no errors. Chikorita is still able to evolve, so obviously its not an error with evos_moves.asm....right? The only problem is that when they reach the level they are supposed to learn a move at, nothing happens. Additionally, their pallets show up correctly in battle and in the Pokedex (I used greenmon) but checking the stats screen changes the pallet to that weird purpley pallet Mew and Mewtwo use. This only happens in the status screen. I'm fairly new to all of this, but I thought it seemed straightforward enough and I really though I'd had this figured out :( can anyone possibly shed some light on this for me? Something's probably out of order. There's actually no need to to redefine Missingnos if you wish to add non-Missingno Pokémon after the last index numbered mon. I'm not sure if I understood you correctly, but did you move around the Missingnos in evos_moves? If you did, that's something that is not necessary, and there's a chance you accidently miss something and stuff gets out of order. The pokédex order for pokémon is defined in pokedex_constants, so you can have Chikorita be, say, Mon166_EvosMoves and still have it set as 152 in the pokédex - if that's what you were wondering. Do the new pokémon learn any moves? Anyways, the palette problem is something I recently encountered, as well. In engine/palettes, VICTREEBEL - the last indexed pokémon - is set to be the last pokémon for which a palette is loaded in the pokédex and status screen. Since you addded the Chikorita line after index 190, the game won't load the palette. Search for VICTREEBEL in engine/palettes, and set it to "MEGANIUM", and it should work. Also, where and how do you encounter this Chikorita? Hey, thanks for the response and for that tip on the pallet entries, totally worked! :) I think I was getting confused with all the Mon_### stuff, I've just left Missingno as they are for now (I will reused their slots later) and added my new Pokemon following Victreebel for the time being. To answer your question, I replaced the starter Bulbasaur with Chikorita as the means of encounter, just to test for now. I decided to start over from scratch, adding just one at a time. Chikorita was 100% working up until I added Bayleef to the game, at which point the whole "level up moves not learning" thing happened again. This time, it at least had the correct starting moves (no Horn Drill this time!) ... the weird thing was, Bayleef's level up moves DID work. After a little playing around, I discovered that removing Chikorita's evolution all together (db EV_LEVEL,16,BAYLEEF) allowed it to learn its level-up moves again. Just to make sure this wasn't an issue with Bayleef, I set it to evolve in to Poliwhirl instead and once again, he stopped learning his level up moves (upon reaching level 8, nothing happened, when he would normally acquire Razor Leaf) ... is there a reason why having an evolution assigned to my new Pokemon would cause this to happen?? Again, for the record, I did add them both after Victreebel's slot if that matters any...so they would be index BF and C0. EDIT: forgot to mention that the evolution ITSELF does actually work; just that having one is preventing my Chikorita from learning its level up moves. Send me your evos_moves.asm to teemuasikainen@icloud.com, and I'll take a look - or set up a Github repository. >Someone could actually let me know if they know what the character limit is per line without the text overflowing, because I haven't checked that out myself. is a perfect fit going all the way to the end of the text box, which only fits when there's no scroll arrow showing at the bottom (meaning: very top line of a paragraph, or bottom line of the last line in the dialogue). Delete one letter to get what fits in all cases. Hey, thanks for the tutorial. I managed to accomplish adding a new slot fairly well for the most part, but my new Pokemon's sprite isn't working correctly, and it just shows up as a garbled mess. According to the first post, this problem seems to occur when "baseStats/mew.asm" inside of the "main.asm" file is not moved to the "base_stats.asm" file after Mewtwo's "mewtwo.asm" listing. I've done that, and yet, I'm still getting a corrupted front and backsprite. Also, if it matters, I'm using the first Missingno. slot (value 1F) that appears after Tangela for this entry. I'm not really sure where to go from here. Any help would be appreciated. Thanks for answering. So, I decided to go with the second method that you suggested to me. I made the changes to UncompressMonSprite's routine, added the "+db Bank(pokemonnameherePicFront) ; padding" line at the end of each Pokemon's asm file, and made the changes to wram.asm. I'm now receiving a new error. Unnecessary plus sign. That's what it has to be. Well, I feel silly now. That solved my issue with compiling the ROM, thanks. However, I've run into another issue. I'm pretty sure that I screwed something up in "home.asm", because certain Pokemon will not have their sprites loaded, and the game will crash. I get the feeling that I've done something silly again. I apologize for my incompetence. If that's not the case, I would try using BGB's debugger to step through the UncompressMonSprite routine, and see what value register "a" is when it gets loaded from wMonSpritesBank. Sorry if this is a dumb question, but how exactly would I go about linking a diff of my changes? I'm assuming it has something to do with GitHub? Type "git diff" and paste that here, if you don't have a repo on GitHub. That's not the whole diff. That's just the first page. You can press the spacebar to scroll through the rest of the diff when running "git diff". Or use `git diff | clip` or `git diff | pbcopy` to put the contents of git diff directly in the clipboard. My bad. Here, I threw it onto Pastebin due to the amount of text. Thanks. There's quite a lot there. Could you also give examples of which pokemon sprites load and which ones don't? I noticed that you've only updated the Bank(FrontPic) line for 149 pokemon. Perhaps, you forgot to do it for the two that you happened to test?